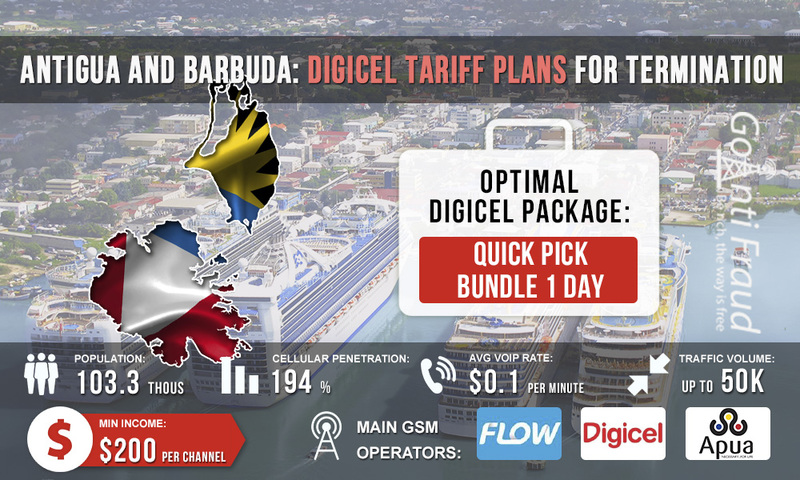 Digicel has been operating in the Antigua and Barbuda market since 2006, when it emerged to challenge the monopoly of the local operator Flow. Digicel GSM-coverage is not inferior to the coverage of its main competitor. Today, the operator is the second largest in the market of Antigua and Barbuda, its SIM-cards will be an excellent choice for operation in the field of voice traffic termination. The cost of one new SIM-card Digicel is about $7, which is quite expensive. At the same time, in company stores they demand to present a passport for buying a card. Therefore, it is better to find starting plans on the black market, but most likely you will have to overpay. The default tariffs for calls to prepaid subscribers are high - for one minute you need to pay $0.35. Fortunately, one can still find advantageous proposals in the form of a few of packaged offers. 30 Days. Connection fee — $39.3, duration — 1 day. Unlimited calls and SMS within the network + 300 minutes to national calls. 7 Days. Connection fee — $13, duration — 1 day. Unlimited calls and SMS within the network + 70 minutes to national calls. 1 Days. Connection fee — $2.6, duration — 1 day. Unlimited calls and SMS within the network + 10 minutes to national calls. To make money on termination using asterisk voip hardware, choose the Quick Pick Bundles 1 Day package. With it a minute of outgoing call will cost about $ 0.008 (if you terminate 300 minutes a day). So you can earn about $ 350 from each channel of your VoIP equipment.